We’re looking for young writers! We tell stories about our past and highlight ideas from the present because we want people to engage with new understandings. Ultimately, we do this because we want to glorify God and make his love known to all people. This is why we need your help. Until August 31, 2018, the Brethren in Christ Historical Society will be accepting submissions for an essay contest. The topic for our first-ever contest is “Let Your Light Shine,” based on Matthew 5:14–16. We invite youth from middle school through college to find a story from your church about a person or a ministry effort that has in the past or is currently sharing the gospel in meaningful or creative ways. Submissions can include biographies, news releases of current events, historical reflections, or reviews of other historical publications on this topic. Participants must be members or attendees of the following churches: Brethren in Christ, Old Order River Brethren, or United Zion Church. Individuals living outside the U.S. are also encouraged to participate. There will be three tiers for this contest (middle school, high school, and college), with one prize assigned to the winner of each category. Select articles may be published in the Society’s journal, Brethren in Christ History and Life. More information, including length and style specifications. Please share this opportunity with youth in your congregation or family! Join us for the 2018 Annual Heritage Service and Hymn Sing at the historic Ringgold Meeetinghouse 14426 Misty Meadow Road, Smithsburg, MD, on Sunday, July 15 at 2 p.m. 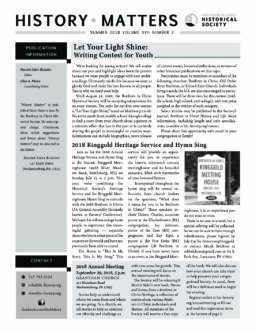 This year, we’re combining the Historical Society’s Heritage Service and the Ringgold Meetinghouse Hymn Sing to coincide with the 2018 Brethren in Christ U.S. General Assembly (formerly known as General Conference). We hope this will encourage more people to experience this meaningful gathering—especially those who live in other parts of the country or the world and have not previously been able to attend. The theme is “This Is My Story, This Is My Song.” This service will provide an opportunity for you to experience the historic nineteenth century meetinghouse and its beautiful acoustics, filled with harmonies of time-honored hymns. Interspersed throughout the hymn sing will be several reflections from church leaders on the question, “What does it mean for you to be Brethren in Christ?” These speakers include Daleen Charles, associate pastor at the Elizabethtown (PA) congregation; Jay Johnson, pastor of the Zion (KS) congregation; and Ray Kipe, a pastor at the Five Forks (PA) congregation (all Brethren in Christ). 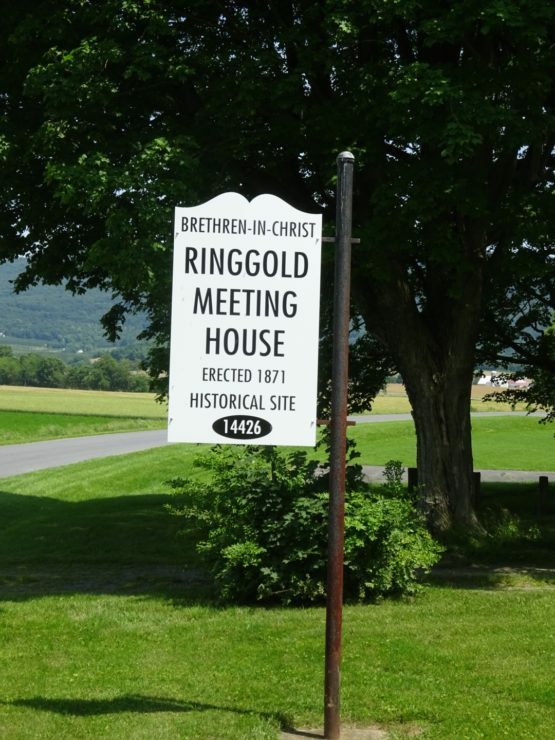 If you have never been to an event at the Ringgold Meetinghouse, it is an experience you do not want to miss. There is no cost to attend, but a special offering will be collected. So we can be sure to have enough refreshments, please register online by July 8, or contact Micah Brickner at [email protected] 64 S. Park Ave., Lancaster, PA 17602. September 29, 2018, 5 p.m. Stories help us understand where we come from and where we are going. As a church, we tell stories to help us celebrate our identity and challenge us with new areas for growth. This annual meeting will focus on the importance of stories. The Society will be releasing E. Morris Sider’s newest book of stories about various Brethren in Christ individuals and themes. All members of the Society will receive a free copy of the book. We will also discuss how your church can take steps to help preserve your congregational history. As usual, there will be a delicious meal to begin the evening. Register online or download and fill out the registration form and mail it to Micah Brickner at 642 Park Ave., Lancaster, PA 17602. Please note the corrected street address; the one on the form is incorrect. Almost every week so far in 2018, there is another observance of the 50thanniversary of something significant that happened in 1968. It was a momentous year: assassinations (Martin Luther King, Jr. and Robert Kennedy); events related to the Vietnam War, including President Lyndon Johnson’s decision not to run for re-election, the Tet Offensive, the My Lai Massacre, and protests against the war; the riots at the Democratic National Convention; the Poor People’s March on Washington; the black power salute at the summer Olympics. Also in 1968, my husband and I graduated from Messiah College. During my final semester at Messiah, I took a class in “Brethren in Christ Life and Thought,” taught by Dr. Martin Schrag. This was the first time this particular course was offered, although it was not the first time Brethren in Christ history was a part of a class curriculum. The class later became the model for one of the current core courses, “Brethren in Christ History and Values,” required for those seeking ministerial credentialing in the Brethren in Christ Church. Many of the final papers for the class are preserved in the Archives. As part of planning for the 50threunion of the class of 1968 this fall at Messiah College, I’ve been looking for memorabilia and found the box of class papers. The topics are varied and reflect not only the interests of individual class members, but also the times; some of the topics were likely recommended by Dr. Schrag or by the other resident Brethren in Christ historian professors, Carlton Wittlinger and Morris Sider. There are several on social and cultural issues: attitudes among Messiah students toward ethnic groups (interestingly, Brethren in Christ students overall were less inclined to have negative attitudes), liquor, the head covering, and mutual fire insurance. 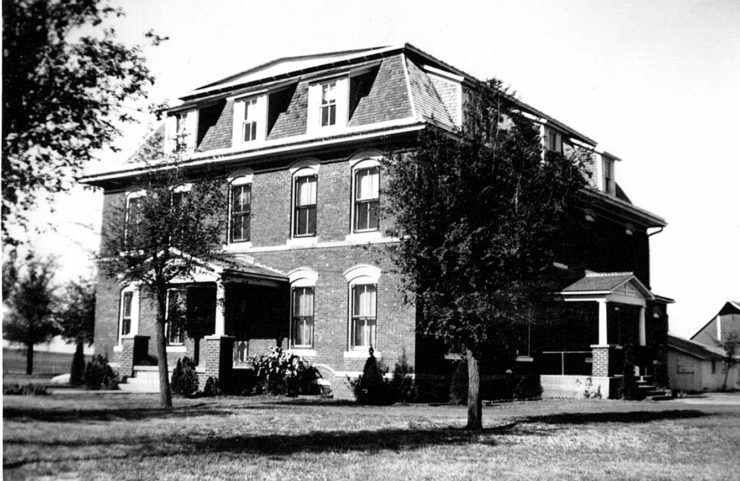 Several class members delved into congregational histories: Upland, California; and Canoe Creek, Fairland, Five Forks, and Locust Grove, all in Pennsylvania. One student wrote about Charles Baker, a Canadian minister, another about the development of the “church extension” movement (now known as church planting), and another analyzed H. Frances Davidson’s influence on attitudes toward education in the denomination. This latter topic is one of several related to education, including one on the founding of Beulah (later Upland) College in California and Messiah College, and the one I wrote on the relationship of Messiah College to the Brethren in Christ Church for which I interviewed several local pastors on how they felt about the direction of the college. Looking back at these papers 50 years later, I am quite sure that as students we likely were not aware of how much we were contributing to the body of written history of the denomination, but Dr. Schrag knew that we were and took steps to preserve the papers for later generations to use in their ongoing research. I know of at least one person who is currently using these papers in his research. The youth writing contest announced on page 1 is a new opportunity for young people to add to the written history of the church. Who knows what value future historians and researchers will find in the articles submitted for this contest? One of four cardboard displays in the Archives. 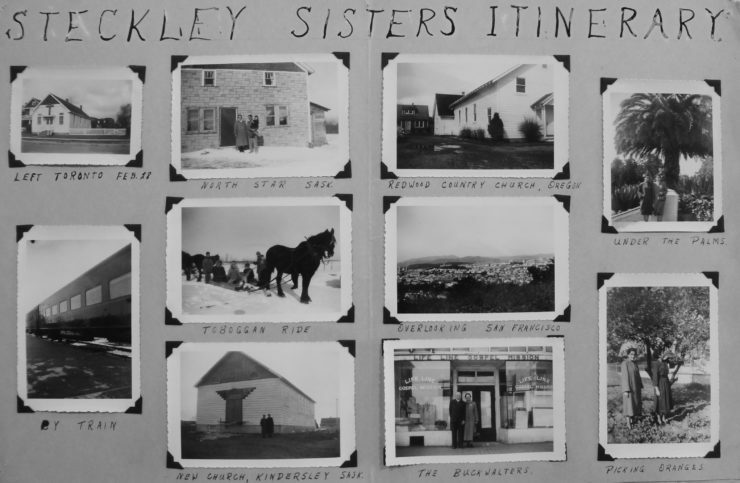 Each panel consists of photos taken by Ruth and Myrtle during their three-month trip across Canada and the U.S.
For a little over a decade (1945-55), Ruth and Myrtle Steckley served the Brethren in Christ Church in its home mission program in Welland, Houghton, and Toronto in Ontario. They became known for their enthusiastic commitment to the church and frequently were featured at General Conference because, as Anna Ruth Sider Osborne put it in her biography of the sisters, “they were among the best speakers the Home Mission Board could bring forward in their programs” (“The Steckley Sisters: An Exciting, Productive Ministry,” Brethren in Christ History and Life, 26, no.2 (August 2003), 3-23). In 1954, the Canadian sisters made a trip to western Canada and across the U.S., often speaking in churches, camp meetings, and conferences. Excerpts of their report, published in the missions insert “Look on the Fields” in the June 7, 1954 issue of the Evangelical Visitor, gives a brief glimpse into their ministry. 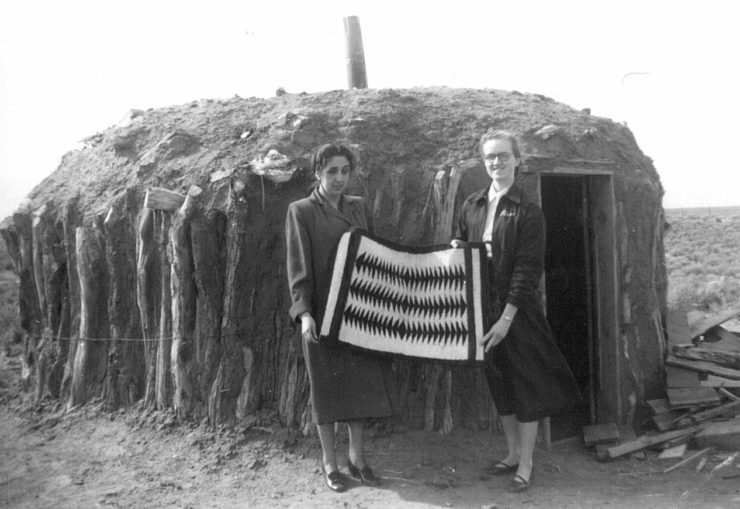 Steckley sisters in front of a hogan near Navajo Mission. 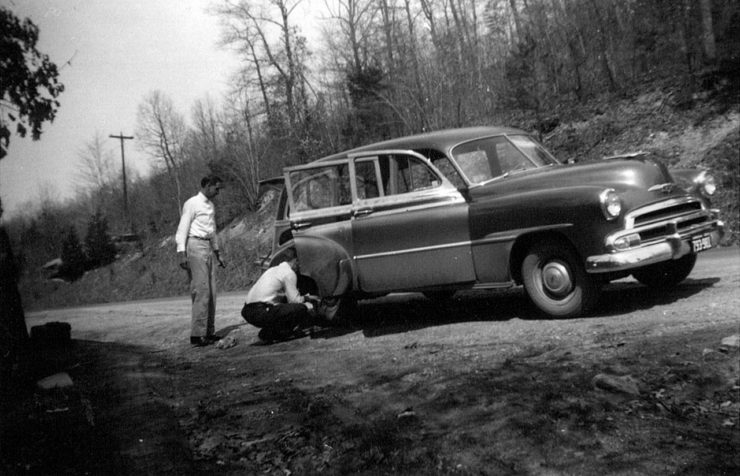 Fixing a flat tire enroute to Virginia. It is often said, “A picture is worth a thousand words.” But in the case of this picture in the Archives’ Photograph Collection, one could wish for at least a few more words of background information about the pilot and the biplane. 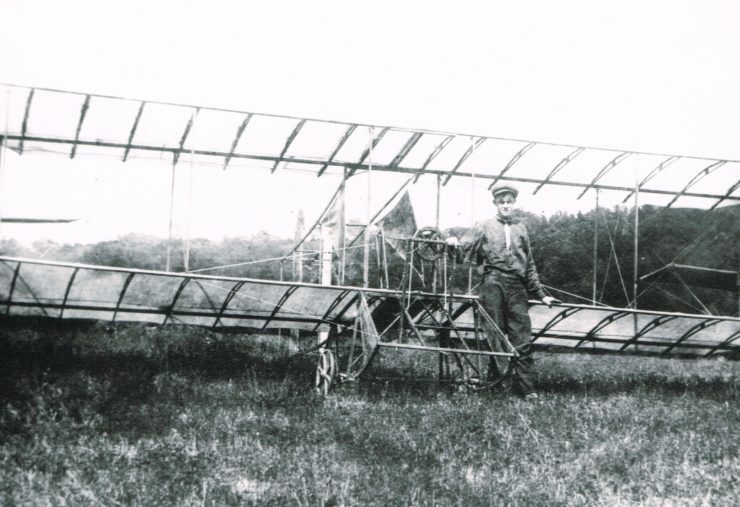 Anyone with more information about Aldous Shaffer of Siddonsburg and the nifty biplane that he built is invited to contact the Brethren in Christ/Messiah College Archives, One College Ave. Suite 3002, Mechanicsburg, PA 17055. Become a member to receive our newsletter and journal.